Revealing mistake: In the final shootout scene, when Rambo takes over the truck mounted machine gun, he shoots the driver, whose blood splatters a lot over the metal guards on the gun. If the blood splattered that much on the guards, it should be all over the interior of the truck which is revealed to only have blood on the floor - none all over the dash or doors. Continuity mistake: In the grand finale shootout scene, the flak guards on the truck-mounted machine gun Rambo uses are immediately covered in blood and gore from the soldiers he shoots in the truck. There is at least one shot in the midst of the massacre where the panels are squeaky clean, then re-appear blood-soiled again in the subsequent shots. Factual error: An unexploded British 'Tallboy' bomb from World War II is found in the jungles of Burma. First, no Tallboy bomb was ever dropped in Burma. Further, the purpose of the Tallboy is to quake the earth to shake concrete buildings down, so dropping one in Burma's jungle would be pointless. Lastly, if a Tallboy had indeed been dropped, it falls at great speed and is hardened to penetrate concrete structures, embed itself below them, then detonate. It would have been underground, not tangled in branches above ground as if made of balsa wood, for Rambo to easily find. Revealing mistake: At the end of the finale battle when the the films villain gets sliced open by Rambo, the effect shot of him rolling down the hill after Rambo kicks him is laughably fake. The injury sustained to him required the villain's upper torso to move almost completely disjointed from his lower torso. The computer-aided effects are sub par, the blood splatter is misplaced on the actor's body and the movements are impossible. Not to mention the fact that Rambo obviously could not have cut through his spinal cord, which would have made it impossible for the body to move in its disjointed manner. Continuity mistake: When the boat is stopped by the pirates they throw two hooks onto the boat to secure the boats. Later in the scene, when Rambo is about to leave he throws one hook off but not the other. Despite this the boat seems to no longer be attached to the pirates boat. Other mistake: After stopped by the pirates and shooting them, Rambo accelerates his own boat again. The boat is driven by a rear mounted engine with a long shaft, with the screw 2 meters behind the boat. But turbulent water is exiting directly under the boat, which would suggest that the boat is equipped with a regular inboard motor, with the propeller under the stern of the boat. Factual error: During the night, School Boy shoots a Barrett M82. Instead of hearing a huge blast (as in the morning scene), the shot is silent. Continuity mistake: After Rambo eviscerates Major Tin and kicks him down the hill, in the next shot the blade of his knife is totally clean with not a smear of blood or gore on it. John Rambo: Live for nothing, or die for something. 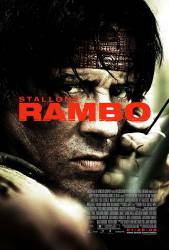 The movie was originally titled "John Rambo", but Stallone didn't want people to think it was the last of the series (as the final "Rocky" was called "Rocky Balboa"), so he changed the name, keeping the door open for a fifth movie.